Assistant coach Brian Samson enters his third year with the Villanova men’s lacrosse team for the 2016-17 season. Samson serves as an assistant coach and defensive coordinator in addition to having duties in recruiting, practice and game planning and video breakdown. Under his second year with the Wildcats, Samson helped transform the Villanova defense and helped the squad reach their fifth-straight appearance in the BIG EAST Tournament, marking the most of any school in the history of the conference. Prior to his time at Villanova, Samson built a powerhouse program at nearby Conestoga High School that won three-straight state championships and hit the No. 1 spot in the national rankings. He led the Pioneers to PIAA titles in 2010, 2011 and 2012 and earned championship berths in 2008 and 2013. From 2009-12, his teams won four-straight District 1 Championships, went 96-8 and finished no worse than 12th in the LaxPower National Coaches Rankings each year. Samson took over the Conestoga program in 2001-02 and from 2006- 12 his teams posted a remarkable 145-24 (.858) record. Overall, he’s won six Central League titles from 2006 to 2013 and compiled an overall mark of 210-72 (.745) in his 13 seasons at the Conestoga helm. 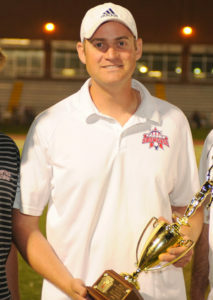 Additionally, Samson was named the EPSLA Coach of the Year in 2009 and the Daily Local News Coach of the year twice. He’s also served as a head coach and assistant coach for the Philly team at the Under Armour Underclassmen Games for several years and also as an evaluator for the United States U-19 National Team. A Radnor High School graduate, Samson played his collegiate lacrosse at Georgetown University and was a starting defenseman for three seasons before his graduation in 2000.